One of my favourite things to do on weekend mornings is whip up a delicious and nutritious breakfast because I have a bit more time to put effort in than I do on week days. A go-to breakfast that I love for these mornings is a smoothie bowl, basically a thicker version of whatever smoothie I would be making but topped with delicious fruit, nuts and seeds for extra nutrition. 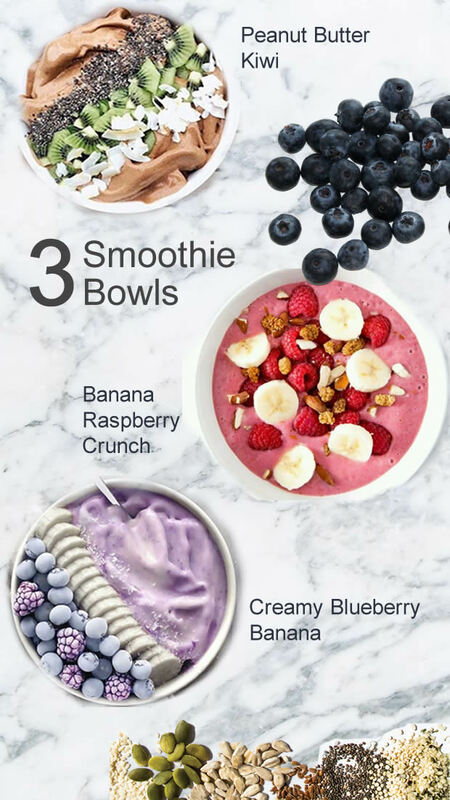 I have three different smoothie bowl recipes to share that you will love if you try them! They are all a little bit different from each other so depending on your taste you can adapt these and use the recipe as inspiration. Let's be real - you can't screw up a smoothie bowl. It all tastes good, just chuck a hint of this and dash of that and it's all good...but if you're worried then read below for me go-to recipes. Top with coconut, chia seeds and kiwi. Top with extra granola, coconut, berries and banana. Top with blueberries, banana and chia seeds. See, it's really as easy as that. Throw some things in a blender, pour it into a bowl and decorate to look pretty. I often like to sit with one of these and relax reading out in the backyard or in between hanging out with my dog. Nourishing your body, mind and soul all at once - no better way to spend a Saturday or Sunday morning (well any morning really).